Recently, I wrote a column about the ciclovías happening around the world, in which urban streets, usually in the heart of a city, are closed to car traffic and opened to city residents; they become a huge city park. 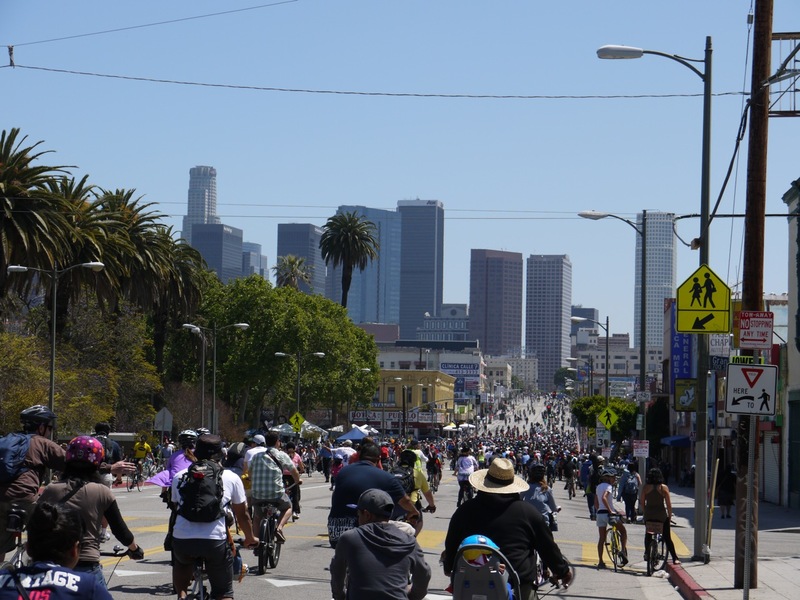 I noted with anticipation that the next big CicLAvia (pronounced seek la vee uh) event in Los Angeles was coming in April and that I would be there with bells on my wheels. 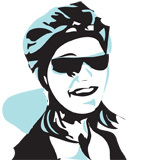 On Sunday, April 15, 2012, I joined 15 of Santa Barbara’s Bici crew to learn firsthand what this event was all about. We joined an estimated 100,000 participants! There was great coverage of the event, including stories by the Los Angeles Times and National Public Radio’s Marketplace. The articles highlight the flexibility of urban streets to accommodate different users at various times of the week or day. These all-day Sunday events bring life and money into a commercial district that is otherwise fairly empty on weekends. Here are some of my firsthand observations of this inspiring day, in the heart of Los Angeles, on bike. Check out the event map to orient yourself, then follow along on our journey of sites and sounds. We piled our bikes into a trailer and on racks, packed into three cars, and headed down to West Hollywood. 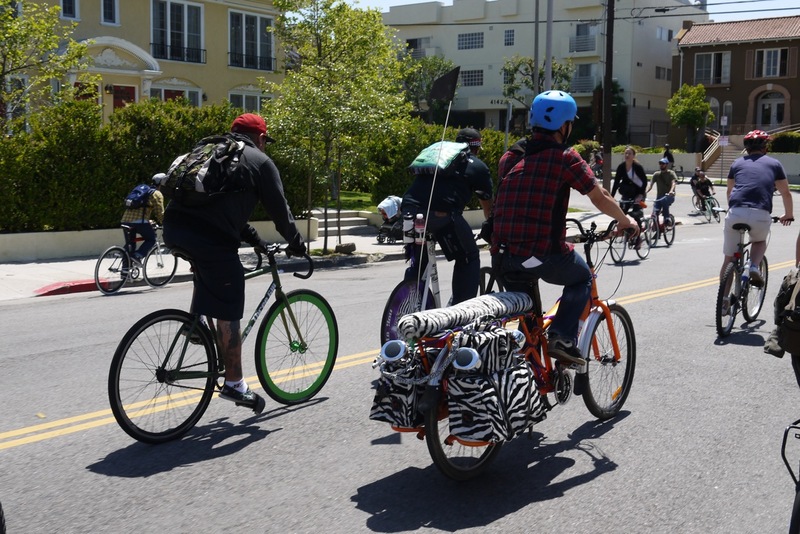 We parked in a random CVS parking lot, got our rides ready, including a Yuba cargo bike customized to pump music and styled out with faux zebra fur, and our posse began rolling toward the 10-mile block party that is CicLAvia. The sun was shining, the air was warm, and the skies of Los Angeles were unusually bright and clear thanks to all the rain L.A. had gotten in the days prior to the event. I started getting giddy when I saw the “road closed” signs ahead, in anticipation of their being closed only to cars, not to us bikies, nor to walkers, skaters, runners, and strollers. We entered the event at the “Bicycle District Hub” off Melrose Avenue. This was one of the areas in the event designed to get people off their bikes and exploring a neighborhood that they otherwise might not know existed. It was swarming with people, but imagine a scene in which everyone is moving as if in a slowed-down dream sequence in a movie. Most folks were walking their bikes, and lots of bikers were standing in clusters talking or simply taking in the scene. The businesses on the closed block were hopping. We felt especially proud to see the busy hub because our own Jim Cadenhead of Cranky’s Bikes in Santa Barbara helped start Orange 20 Bikes and the sister organization to Santa Barbara’s Bici Centro, the Bicycle Kitchen. Both shops were on proud display to the thousands of visitors meandering around the block. The molasses-like pace of the crowd, now riding, continued as we headed down through residential neighborhoods (New Hampshire Ave., 4th Street, and on west toward the 110 freeway). Residents were hanging on their porches or selling snacks and water, calling out, waving, smiling, enjoying the spectacle. There were intersections in which the route crossed streets open to cars. At each such juncture there were crossing guards (some volunteer, some police, some private security guides), calmly directing us to stop or go. I was immediately struck by the broad diversity of riders and by the unified and mellow energy – exhibited even by Los Angeles riders I would normally expect to have a more aggressive, fast, and impatient riding-style. They, too, were there beside me, smiling, patiently waiting at the lights, grooving to the music, taking in the wonder of a day without cars on L.A.’s streets. And most of these riders clearly had been riding bikes for a good while. These were riders with their own biking style, people who have learned to carve out a place for themselves in the urban world of street riding. And the kids were out en masse, charging forward on their little bikes, some still pedaling away on training wheels. We took a quick stop on the bridge over Highway 110 for snacks, a change of musical genre (reggae! ), and a chance to smile and wave at the hundreds of bicycles happily meandering past us. Cars on the freeway honked supportive honks, and we waved back. People would call out hellos to us, or simply bob their head to the music. A group of guys with pimped-out low-rider bikes cruised by, one of them working his hydraulic front forks up and down, up and down. We found MacArthur Park filled with bikes and pedestrians and a group doing improvisational theater. There were booths of local environmental and bike groups, touting their programs, and again, hundreds of people simply milling around. The block party really started bumping as we slowly rolled along West 7th and onto Spring Street. Bars and coffee shops were teeming with people, and parked bikes were three to four layers deep on the sidewalk. The City Hall Hub had DJs playing on the corners, more vendors and food trucks, and continual streams of smiling bikers, runners, skaters. We had a leisurely lunch at El Pueblo de Los Angeles and then headed back toward West Hollywood as the event was wrapping up. Our ride home resembled a daydream I have often had while riding in traffic-clogged urban areas. Wide streets, filled with bicyclists, zooming along, not having to stick to the small strip of right-hand roadway. A dream come true, in the streets of Los Angeles! The next CicLAvia is October 14, 2012. Who’s in this time?